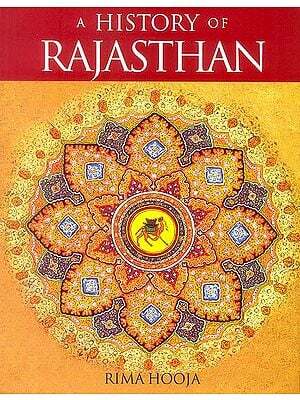 Rajasthan is a legendary land of chivalry, sacrifice, romance and heroism. It is a play where colours too, assume the magnitude of legends making it also the legendary land of India’s miniature paintings. Rajasthan and colours are synonymical: be it the colours in the eyes of a coy maiden; the glowing gold on the countenance of a youth; the brilliant colours of Rajasthani costumes; or the colours scattered on the leaves of paper. Rajasthan with its art activity scattered over the entire land with Mewar, Bikaner, Jodhpur, Kotah, Uniara, Kishangarh, Jaipur and Bundi as its principal centers, has to its credit some of the world’s masterpieces in miniature paintings. 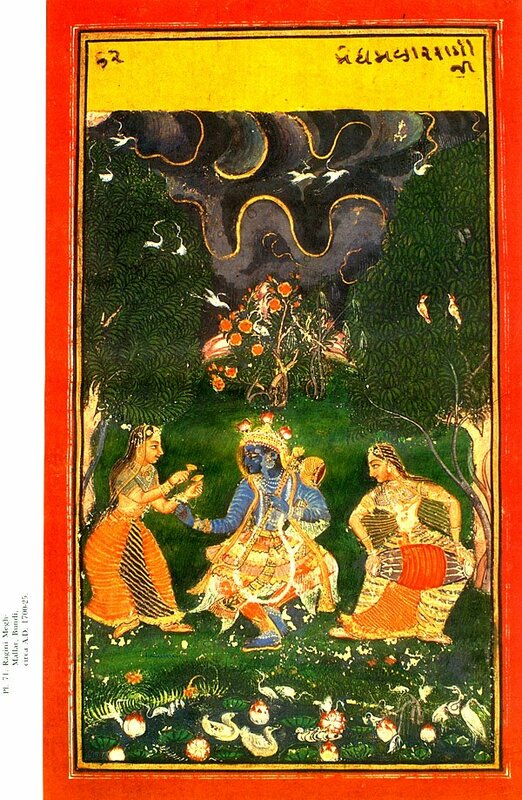 The author in this study of Bundi miniatures has attempted to apprehend, though on a smaller scale, the trends and tendencies in the development of Bundi art style during late 16th century to mid 19th century. She has tried to find out the great secret and the mystic strength of inherent lines and colours of Bundi Paintings and has thus attempted to know the great ocean by a segment of it. Jiwan Sodhi, Lecturer in Drawing and Painting at DAV College for women, Amritsar, obtained her M.A. Fine Arts and History of Arts from Guru Nanak Dev University, Amritsar. She was awarded the degree of Doctor of Philosophy by the Guru Nanak Dev University and was honoured by Rotract Club Amritsar in 1980 for her painting “Three Ladies”. She performed solo shows at the Indian Academy of Fine Arts in 1984; DAV College, Batala in 1985, 1987 & 1989 and at Manali in 1992. She participated in Punjab Lalit Kala Academy, Chandigarh 1983-84, Touring Exhibition PLKA 1992, Indian Academy of Fine Arts, Amritsar 1983-85, 1992, 1993-95, Rashtriya Kala Mela 1994, Bombay and in Group Show, Eighth Triennial World Conference, The World Council for Curriculum and Instruction, 1995-96, Amritsar. She has published articles on wall painting around the Golden Temple, Amritsar, Lotus Ganesha, Baramasa – The month of Shravana, The month of Magh & Rashtriya Chin (National Emblem). Some of her articles such as Krishna through miniatures, Vishnu, Guru Granth Sahib Ragamala & Baramasa are in process. At present she is doing research on the Janam Sakhis of Guru Nanak. 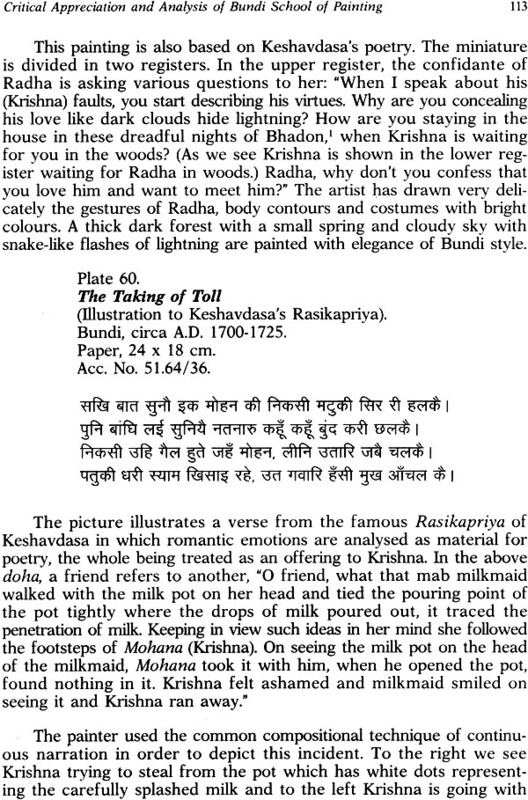 It was a great pleasure to go through Dr. Jiwan Sodhi’s work on the Bundi School of Painting. The book was given the final shape when I happened to be the Director General of the National Museum, the collection of which served as the source material for the dissertation. Under the guidance of her research supervisor, Dr. Daljeet, Keeper of the Paintings Department, Dr. Sodhi had ample opportunities to examine the original works of Bundi School and also to compare them with other major styles of Rajasthan. The school had its birth in the rocky region of Chunar in the early 17th century when Raw Rattan Singh was controlling the eastern Uttar Pradesh under Akbar and Jahangir. The workshop subsequently shifted to the land of Bundi which has beautiful view of mountains, rivers and forests rather a rare feature in the sandy Rajpootana (Rajasthan). While all chiefs patronized the art of painting, it was Rao Ummed Singh under whose initiative the Chitrashala of Bundi place was built. Consequently, the place ushered into an independent and distinct school of miniatures. Known for deep blue sky, with flight of birds, lightning, green trees and hills in the background, plantain groves, multicolored mansions, use of yellow, orange, crimson and Persian blue colours and finishing touch of gold, the Bundi miniatures look very pleasing. Female beauty finds a special favour although one lady is similar to the other. Rendering of Pauranic legends, Krishna Lila, particularly based on the Bhagavata, Baramasa, Nayaka – Nayika Bheda and some love scenes of later period were popular in the Bundi atelier. Dr. Sodhi has highlighted all these aspects of Bundi style and has also discussed its distinctness and interaction with other regional schools. The excellent presentation has been suitably corroborated with selected illustrations. The work ahs added further grace to the grandeur of a famous style of miniatures. 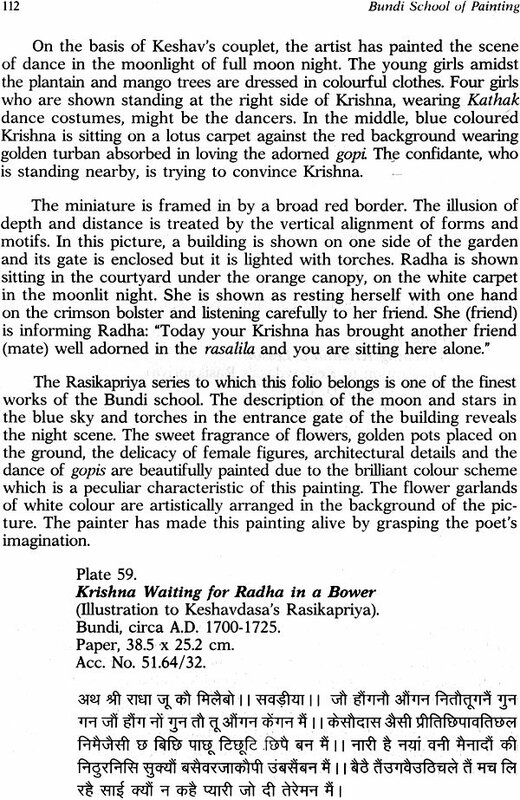 I am sure the book will be received well by scholars, critics and students to Indian art. I wish a bright future to the author.